This artist’s concept shows a possible model of Titan’s internal structure that incorporates data from NASA’s Cassini spacecraft. As of March 6, 2014, Cassini has flown by Titan, Saturn's largest moon, 100 times since the probe's arrival around the planet in 2004. A far-flung NASA space probe flying around Saturn zipped past the ringed planet's biggest moon for the 100th time on Thursday (March 6). The Cassini spacecraft made its closest approach to the hazy moon Titan at 12:45 p.m. EST on Earth (5:45 GMT), according to officials at NASA's Jet Propulsion Laboratory in Pasadena, Calif.
NASA's Cassini spacecraft exploring Saturn and its moon has reached a major milestone, the 100th flyby of Titan, largest Saturnian moon. This image is a special logo made to commemorate the March 6, 2014 mission milestone at Saturn. JPL officials say Titan, where temperatures can drop to minus 290 degrees Fahrenheit (94 kelvins), is like early Earth in a deep freeze. It may even harbor ice volcanoes that spew water ice and hydrocarbons. For 10 years, Cassini's images have helped scientists peer beneath the moon's orange, nitrogen-rich smog to see amazing features on the face of Titan like vast lakes made of methane and ethane that are larger than North America's Great Lakes and continually replenished by hydrocarbon rain showers. With Cassini data, scientists have detected an ocean composed of water and ammonia below Titan's icy crust. Using radar data from the spacecraft, researchers have also determined that Ligeia Mare, the second largest sea on Titan, is about 525 feet (160 meters) deep. The flyby comes during a change in Titan's long seasons. Spring is finally giving way to summer in in Titan's northern hemisphere for the first time since Cassini arrived at Saturn in 2004. This means icy clouds are retreating and revealing and never-before-seen views of the lakes and seas at the moon's north pole. Near-infrared images of the region could give scientists clues about the surrounding terrain, JPL officials say. Because Titan harbors water and organic materials, scientists think it could be a potential host of alien life forms. Linda Spilker, Cassini project scientist at JPL, said the potential for like on Titan is twofold because of its two types of liquid bodies. 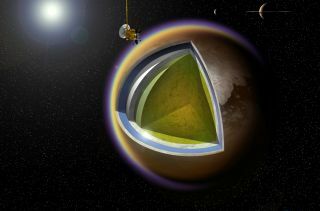 "Could a unique form of methane-based life exist in Titan's liquid lakes and seas?" Spilker asked in a statement. With a global ocean of liquid water beneath its icy crust, could life exist in Titan's subsurface ocean?"